A page is the container for the content that you want to show in a guide. Think of this like a page in a document. You can create a page in a similar fashion to a customization – click on it, name it, and drag it in the place you want it to show in the document. Title – This is the title of the page that will show up on the left panel for the reader. Elements – These are objects that you can create in a page to display to the end user. 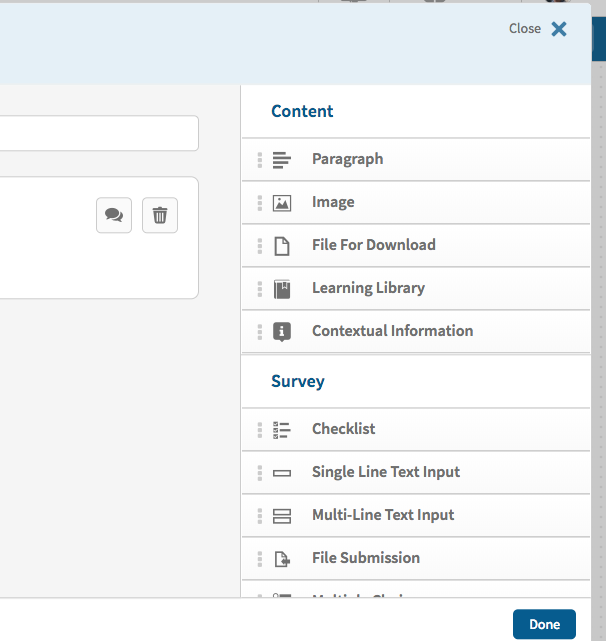 Survey Tools – These are questions that you can ask of a user embedded in your content. By clicking on these object, they’ll be added to your page where you can edit them. The quality checker on the left side of the page grades the readability of your content. In the comments section, you can see comments left by other authors or reviewers.